Welcome to RUTABAGA.ORG. It exists for the same reason that rutabagas do. Rutabagas are not turnips. 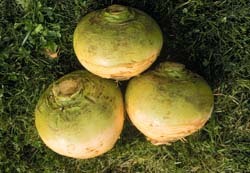 Rutabagas are larger, rounder, denser, and sweeter than turnips. If you are looking for information about rutabagas, the authoritative site is the Rutabaga Fact Sheet published by the Ontario Ministry of Agriculture. To see what's exciting and new in the world of rutabagas, you should visit the web site of Canada's Atlantic Cool Climate Crop Research Centre in St John's Newfoundland. 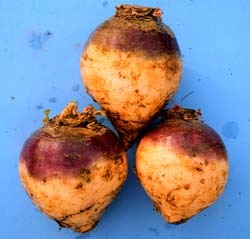 They are the only place in North America that is actively conducting research in rutabaga breeding, and they have developed the three excellent cultivars of rutabaga shown below. Should you wish to buy rutabagas, the reference standard for evaluating them is published by the Canadian Food Inspection Agency. Quality Produce in Exeter, Ontario will be pleased to take a telephone order for a bag. See also the Advanced Rutabaga Studies Institute in Forest Grove, Oregon. 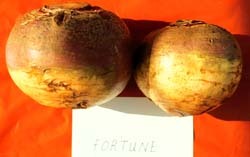 The "Fortune" rutabaga, developed in 1978, received in 1979 the Award of Merit from the Royal Horticultural Society in Great Britain. The "Kingston" rutabaga, developed in 1987, is also quite resistant to clubroot.